Two of our past winners, Sarah Brown and Jackie Wax Adcock, won the national A.C.E. Award and received a $10,000 scholarships. 2013-14 winner was Stephanie Winn and runner up was Blair King. Both excellent candidates. With her sterling academic record, initial perusal of Stephanie’s application would seem to indicate that Stephanie would be a strong candidate for the Youth of the Year Award. Here is a young lady with a 4.+ transcript, 550+ hours of volunteer service, Co-Captain of her swim team, class historian, participation in the Junior Council of World Affairs, induction into the National Honor Society and strong academic recommendations from staff. Her narrative of overcoming fear of water to excel in swimming gave little indication that she had overcome the type of barriers that previous ACE Award candidates had encountered. However, there was something underlying her narratives that suggested the need for further inquiry. She has never met her parents. She was given to a family friend and raised with them until the age of 6 and things were pretty unstable. Fortunately, she was then adopted by Betty Davidson. Although her adoptive mother provided consistent nurturance, there continued to be disruptions in her life as her mother lost her job, faced bankruptcy and they were displaced from their home. Ms. Davidson is still struggling to find the financial stability that fosters security for optimal participation in life. It is rather astonishing that Stephanie is so appreciative of the current support system that she almost dismisses these earlier events as obstacles. She exhibits a very mature sense of her future, with a very sound foundation in the field of dentistry, but also with aspirations of engaging in in astronomy. Her love of helping others is self evident in her hours at Maria Joseph nursing home where she helps conduct resident activities and transports residents. In addition, she shares here skills assisting with computer work involving Excel and Word. She demonstrates her work ethic through her position as an Office Aid this year and has had a very positive experience as an Intern in the dental unit of Children’s Medical Center. The 2012 ACE award winner was DeVante Johnson from Chaminade Julienne High School. This is the second winner (the first being Cherise McBeath – 2002) from that school, indicating the awareness and support that C.J. provides it’s students. DeVante was born prematurely and had to have immediate heart surgery. He had problems with reading, writing and spelling. Although he had many tutors, he credits his grandmother who was a genuine task master. In spite of growing up in an impoverished neighborhood, rampant with violence and pressure to participate in drug dealing (his cousin was a drug dealer who was shot 6 times in a robbery), he proved to succeed scholastically and has given back to his community as a tutor and volunteer. He has been on the National Youth Leadership Council, served as a Peace Ambassador and served in the Wesley Community Center. He has enrolled at Miami University and plans to get a degree in engineering and a minor in Business. DeVante also won the Ohio West-Virginia award where he was surrounded by family, including aunts from a distance, to celebrate his accomplishments. In addition, the Exchange Club of Dayton provided the speaker for the district luncheon, Ms. Sarah Brown, previous 2003 Dayton, District, and National award winner. Ms. Brown is currently a classroom aid in Dayton Public Schools and is near completion of her degree in special education. This was the second time a previous Dayton and subsequent National Exchange Club winner was selected to address the Youth Awards Banquet. In 2011, Ms. Jackie (Wax) Adcock, the 2001 national winner spoke about her continued progress. She spoke of fond memories shared with club members at Convention and how much she valued our support. She said that she was currently working on her aviation technology degree at Sinclair College. Our 2010 A.C.E. Award honoree is Mr. Eran Brown of New Choices Community High School. He was honored at a special luncheon on Thursday, April 22, 2010. Our 2009 A.C.E. 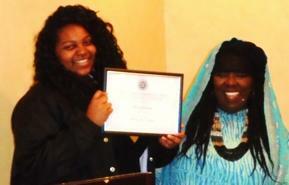 Award was awarded to Miss Nicole Wells of Thurgood Marshall High School, Da yton, Ohio. Miss Wells was honored at a special luncheon held at The Walnut Grove Country Club on Thursday, April 23, 2009. Miss Wells was subsequently honored as the Ohio/West Virginia District A.C.E. Award winner, Saturday, May 15, 2009, at the Kalahari Resort in Sandusky, Ohio. Pictured below at left is Club President, Jim Suddath, presenting Nicole, center, with a club award. To the right is District Youth Chairperson, Mary Nossaman, who subsequently presented Nicole with a $1,000 check. Top Picture at left: Our 2008 club A.C.E. Award winner, Mr. Willie Lamont Sample, of Woodward High School, Cincinnati, was recognized as the Ohio/West Virginia District winner at the District Convention in Kings Island, May 17, 2010. Presenting a $1000 scholarship award to Mr. Sample is (left) District President Sue Jaros, and (right) Mary Nossaman, Fremont, Ohio, District Youth Chairperson. Below: Mr. Sample holding his diploma at the Woodward High graduation ceremony. Our 2018 A.C.E award was given to Darien also the winner of the Ohio-West Virginia District award. This young lady has overcome significant obstacles for many years, but they have inspired her to be a role model for her peers and her siblings. In addition to difficulty with ADHD, she has had the additional distress of insecure resources as her single parent mother had to decide whether to buy food or pay for utilities.Some days local pantries were what provided sustenance. She attributes her achievements to her mother, as unfortunately her biological father only entered her life when it benefitted him and then he would be disparaging of her aspirations. The parents separated when she was 4. When she was 9, a strange man came up behind her at school, and only when he identified himself, did she recognize him as her father. She has had to deal with anger issues regarding her father. One of the stand-out aspects of her character is that she recognizes that set backs can be paths for future development. For instance, she recognized that although she was frustrated with her lack of progress in a physical science class in her high school freshman year and failed the course, she needed to learn what her options were (in this case summer school) and, in the future, she needed to be a self-advocate in other classes to create a connection with teachers so they would help her. One issue early in high school was over-use of the phone, so she learned to discipline her use. Later in her schooling, she recognized that her poor weight management was adding to her health problems and limiting her aspirations to be a cheerleader. When there was a $400 fee to become a cheerleader, she managed to work two jobs to earn the money. Her father had promised to help, but despite his renigging, she managed to get the fee paid by her own efforts. In addition to her current successes in school, as attested to by her teachers, Darien has proven to be an independent motivated learner, who is “not afraid to take risk[s], question theories, challenge the norm, nor afraid to shine.” Further, she helps support the family with two jobs, and not succumbing to the typical “join-me” adolescent fun, she takes her leisure time to participate in community volunteer efforts with her girl scout troop. She develops healthy friendships and is planning to room with a friend when she goes to Alabama A&M University. She is resourceful as well, as evidenced by her ability to find transportation to the club presentation. (A ride was offered.) Initially a mother, then a grandmother, then an aunt, but finally she called to ask if her cousin could bring her. It was obvious the shared pride her cousin and her children had for their cousin Darien at the celebration.